Human-centric lighting technology by OSRAM Lighting Solutions meet or exceed applicable workplace standards. They can improve motivation, support a positive attitude and atmosphere, and boost employee satisfaction and productivity. Meeting rooms require flexible lighting to meet changing requirements. Fixed and movable lights and convenient light management systems by OSRAM Lighting Solutions keep your options open, create a positive ambience for every meeting, and save energy. The first impression always counts. Give the entrance area of your office building an inviting appeal. Lighting and control technology and expert advice from OSRAM Lighting Solutions will help you make your visitors feel instantly welcome. 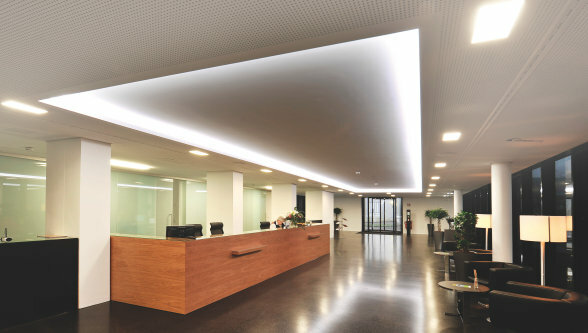 From corridors, hallways and stairs through to social rooms, cafeterias, car parks and facades, an office building has many amenities that require adequate lighting. OSRAM Lighting Solutions has all the expertise to make the use of every room and area a pleasant experience.